A new study proposes that our earliest eating experiences establish dietary habits for the rest of our lives. If we eat healthy, “complex” foods in infancy, these tastes become programmed as our favorite flavors for our whole lives. One more reason making your own baby food is a good idea. Today, unfortunately, most of those early lovin’ spoonfuls contain more sugar and salt than is nutritionally wise. A recent study in the Journal of Public Health found that 53 percent of processed baby and toddler foods lining supermarket shelves (at least in Canada) have an excessive number of calories from simple sugars, and 12 percent of them have too much sodium. The authors, noting how overindulgence on both of these nutrients is tied to cardiovascular disease and diabetes, suggest that early exposure to overly sweet or salty meals could promote a taste for these unhealthy ingredients in the future. How does breast milk play into these research results? I have never tasted it since I was a baby, but I have read it tastes like warm vanilla ice cream. If that is the case, wouldn’t that hardwire our brains for sweets? Our diets are unhealthy, that much is clear. Now, an increasing number of scientists and physicians wonder if our propensity for unhealthy, obesity-inducing eating might be tied to the food choices made during our first weeks and months of life. 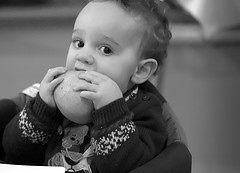 Indeed, the latest research indicates that what we learn to like as infants paves the way for what we eat as adults. If true, we might be able to tackle the obesity epidemic in a new and more promising way, one that starts with the very first spoonful. Whole foods from the start are obviously the first step towards lifelong healthy eating. I never believed that rice cereal was ever healthy….I totally by-passed it with both my kids….went straight to sweet potatoes, bananas, avocados and the like. Rice cereal also contributes to obesity later and (IMHO) picky eaters, wouldn’t it? That stuff tastes like cardboard. My chiropractor also said NOT to introduce food until the first tooth had broken through (something about the digestive juices are not ready until the first tooth cuts). I gave my kids a bit of rice cereal, but not for long at all, because that stuff is boring. My kids were all fast to go to pureed food, and I quickly switched to foods I made myself with a food mill with all of them. So much better than buying baby food. Completely skipped the toddler meals they sell because I couldn’t see those as remotely healthy, plus I could make food good for my toddlers far cheaper.